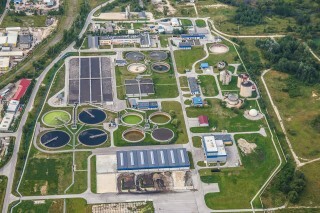 Wastewater treatment (WWT) sludge refers to the residual, semi-solid material that is produced as a by-product during water treatment of industrial or municipal sewage. Unfortunately such sludge cannot be disposed in a natural way on fields or normal landfills anymore as they contain hazardous materials, harming nature and humans. In Europe and other countries the producers of such sludge are forced by law to dispose the sludge in special, secured for hazardous material, disposal warehouses or depots. This of course is very expensive. Also the energy still stored in the sludge is not recovered and used. In addition, the vital Phosphor as fertilizer is irretrievably lost. This is a rapidly growing problem, as every organism, human, animal or plant, needs this phosphorus as a basis of life. ProCone's BASURAgas® Universal System converts WWT sludge deriving from industrial or municipal WWT into electricity, heat, steam, biofuels or other chemical materials on a low cost basis. In addition, vital phosphorus in a highly purified form is provided for agricultural use along with other important fertilizers such as potassium, magnesium, sulfur and nitrogen. This form of conversion requires the materials treatment at the front end of the gasifier and a gas cleaner, gas compressor and a conversion unit, depending on the desired product to be produced, at the back end of the gasifier as the basic configuration. However, most of the time electricity is produced to cover the power needs of the WWT. Another very attractive application, in combination with the WWT sludge conversion, is to produce drinking water by purifying the collected moisture contained in the slug. 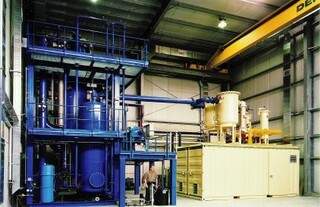 The energy for the purification plant is also produced by the BASURAgas® Universal System.